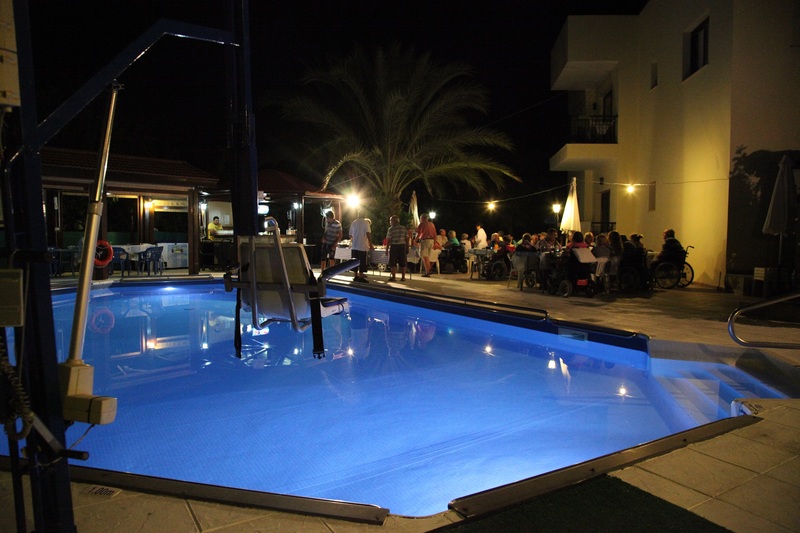 C&A Apartments is an independent, family-run, tourist complex situated in Polis, on the beautiful island of Cyprus. From the moment you arrive, you will be greeted by one of our family members. We will do our utmost to provide you, as our guest, with the best possible experience – whether you are disabled or non-disabled. We are award-winning specialists in providing accessible wheelchair friendly accommodation, equipment, and services to our disabled guests. I am Chris, one of the owners. I have been in a wheelchair for over 28 years which has enabled us to turn our apartment complex into a ‘little oasis’ to ensure you have a relaxed holiday. I have tirelessly campaigned to ensure areas around Polis have accessible beach pathways and that some shops, restaurants and banks in the area have ramps and accessible toilets. Browse through our website to discover our completely accessible holiday complex where you should find everything you need but should you have any questions please don’t hesitate to email us. We look forward to welcoming you into our home where we pride ourselves on the many guests that return to us year after year, some of which we now consider our friends. The complex comprises of 19 units in total, Studios, One and Two bedroom apartments, and a very large 3 bedroom apartment, all of which are tastefully decorated and furnished, with Air-Con and heating as required. ALL rooms are accessible, with room to manoeuvre. The studios and apartments have large, level access wet rooms rooms with showers /fixed shower seat, (or showerchair etc which can be hired here depending on personal needs), the toilets have drop down rails for more support at both sides. The on-site restaurant is family run, serving delicious , freshly made Cypriot Cuisine,with locally sourced fruit, vegetables, salads, meat and fish, to name but a few. The dining is set out in ‘buffet style’ so you have a greater choice to add to your plate. We have a spacious sun terraces around the pool side with sun-loungers and parasols. The sun loungers can be accessed easily by a wheelchair user by assorted height sun lounger pads which make transferring easier, too and from the wheelchair. The pool side hoist gives the disabled visitor the opportunity that they may not normally have of accessing a pool….so invigorating. At C & A we have our own ‘on site ‘ adapted taxis for transfers and excursions, the vehicles are fitted with Ricon tail lift and special safety clamps and seat belts. If you are hoping for a special holiday in lovely surroundings that have no accessibility obstacles, then C & A Hotel Apartments looks forward to welcoming you to our home.